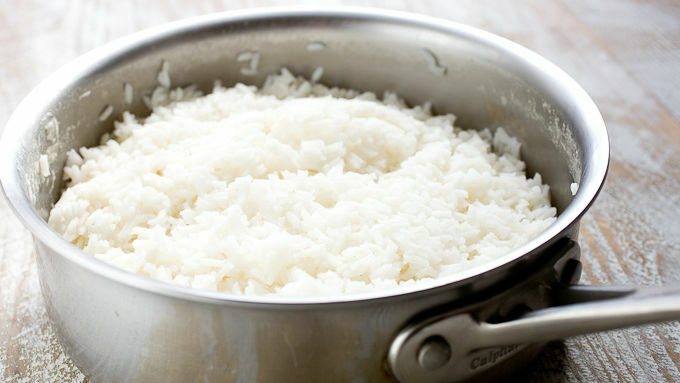 Reheat rice in the microwave with a tablespoon of water, so it’s fluffy and hot (about 2 minutes on high). 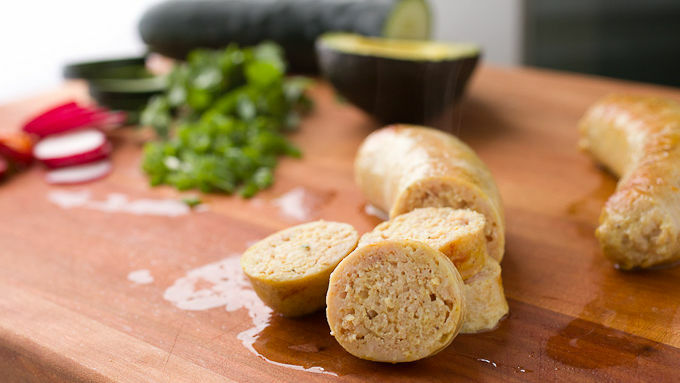 Cook chicken sausages in a skillet with water. Simmer them until they are cooked through, about 10 minutes, turning occasionally. Once they are cooked through, you can optionally drain the water from the pan, add a drizzle of vegetable oil, and crisp up the sausage a bit. Then slice each sausage into rounds. Cook eggs over easy or sunny-side up in oil over medium heat. To serve, pile the rice on a plate and make a divot in the center. Add the egg to the divot. 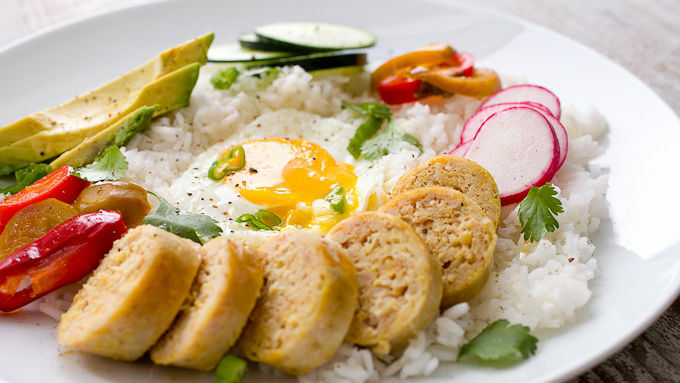 Surround the egg with sliced chicken sausage and slices of avocado, cucumbers and radishes. Garnish with scallions and spicy pickled peppers. Salt and pepper to taste. Learn to make a classic South American street-food dish at home! The first time you walk around a market in South America, you’ll be smacked with smells. Most good. Some bad. But the good ones will be really good, and you can bet that at least some of those smells will be coming from a cart selling arroz mixto. Depending on the country or even the market you are in, this dish can vary wildly, but essentially it’s just rice with stuff in it. You mix it all together and it’s delicious. A few key pieces though: Besides the rice, most arroz mixto will have egg, some sort of meat, spicy peppers, and usually avocado. But, you can kind of make it your own. This version is my favorite for a quick weeknight meal with leftover rice. There’s no need to hunt down exotic ingredients. Just basic stuff works well and is delicious. Obviously you’ll need rice! 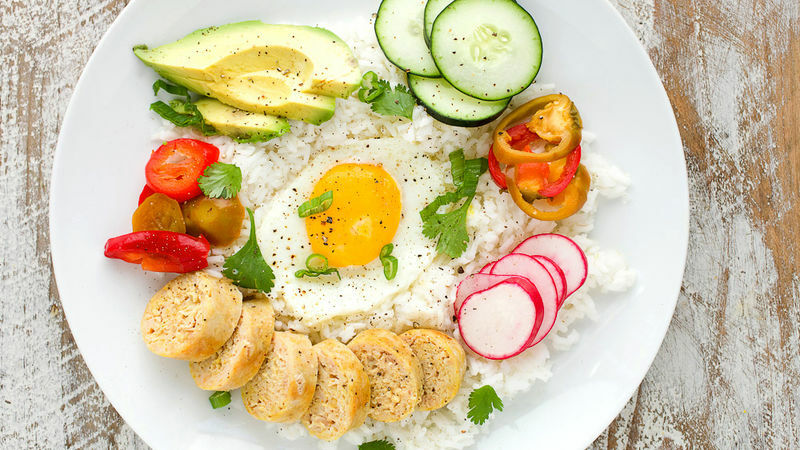 The truth is you can use any leftover rice for this plate of food. Just microwave leftover rice with a drizzle of water for a minute or two to bring it back to life. Then you’ll need an assortment of delicious veggies. Slice these all thin so they can be mixed into the rice easily. As far as the protein goes, I went with chicken sausage. The rest is pretty straightforward! Pile the rice on a plate and make a divot for the egg (either over easy or sunny side up). Then just stack your ingredients around the plate and garnish the whole thing with scallions and season with salt and pepper. It’s simple food, but it’s hearty and delicious. Make it your own and try it out!